The Mindstone Sketchbook was sent to me to review here on the blog. This hasn’t altered my write up of this product. All true thoughts here. I had never heard of Mindstone before they contacted me to ask if I would like to test run a couple of their notebooks for review on the blog. They are a small Austrian company who wanted to make the perfect notebook. Today I will be reviewing their A5 sketchbook which I have been using for the past few months. The Mindstone sketchbook has a navy linen cover with flourishes of red used on the elastic closure and bookmark. The binding is on the short side of the notebook making this a great landscape mode sketchbook. The stock inside is 120 g/m2 bright white with each page perforated so any of them can be removed. It also comes with a handy pocket on the inside back cover. There is a crazy design on the inside cover showing off a little of Mindstones personality. These elements of this notebook really set it apart from other sketchbooks on the market. A sketchbook with a bit of personality in a sea of black sketchbooks is quite nice. Inside backcover with the crazy design and handy pocket. I have used watercolours, Uni-ball Posca markers, ink, drawing pens and pencils in this notebook. 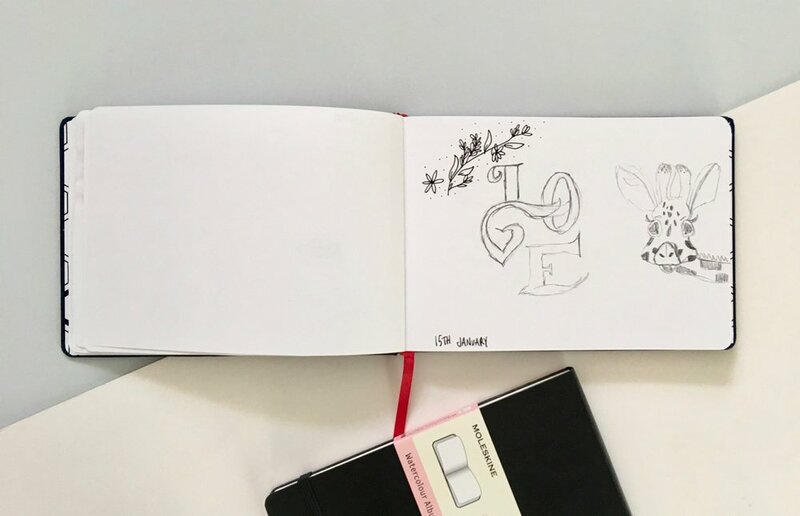 I wanted to test it out with as many different tools that I could to see how the notebook held up and how the paper responded to these different art tools. The results are a mixed bag. Firstly the paper definitely isn’t made for watercolour. The paper is not heavy enough and ripples a lot when water is applied. This buckling doesn’t bother me particularly as this is a sketchbook and a place to experiment rather than create masterpieces. Heavier markers also suffered from the paper quality and resulted in a lot of bleed through. The Uni-ball Air and the Uni-ball Posca were some of the worst. It seems that wet or bold pens saturated the paper too much. Using ink, drawing pens and pencils worked absolutely fine in the Mindstone sketchbook as you would expect. 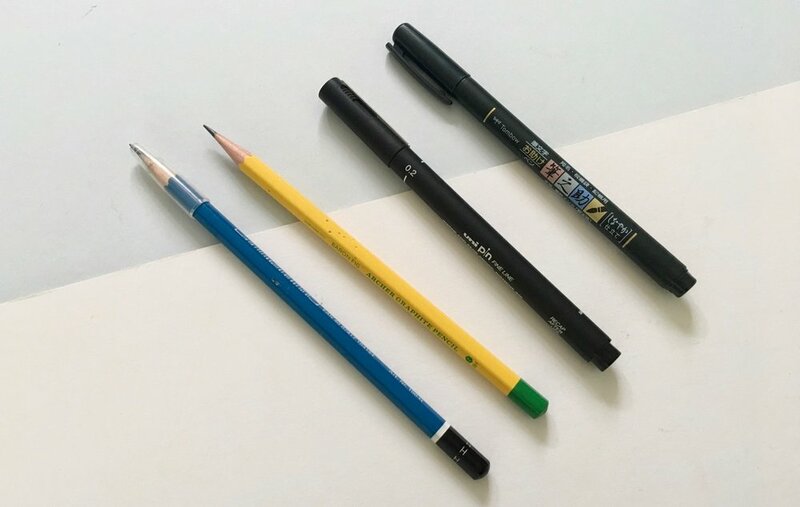 The paper is very smooth which means there isn’t really any tooth for pencils. With the different mediums I used in the notebook the binding did suffer. The watercolour and pens put too much weight on the stitched binding and the pages pulled away quite early on. I haven’t applied any extreme stress to the sketchbook, most of the use was at home. 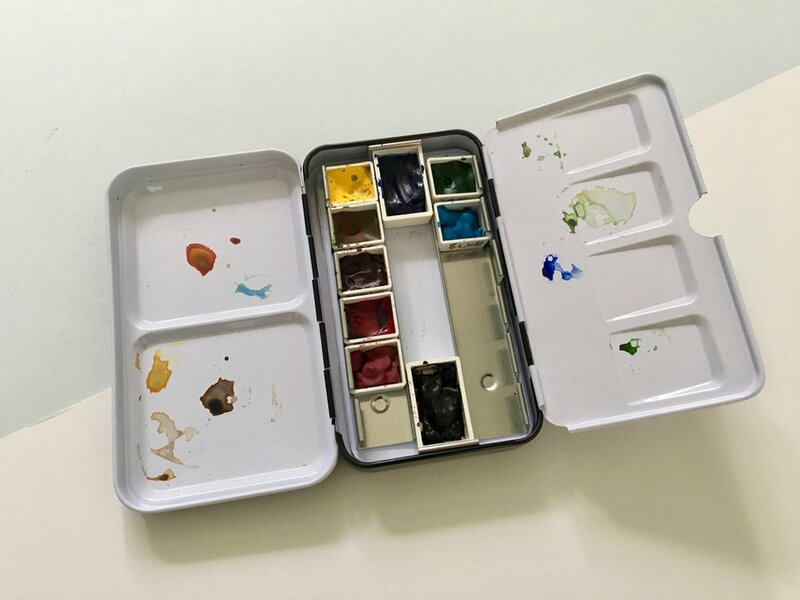 For urban sketchers or people who like to use lots of different mediums within their sketchbooks this may not be the right option. My thoughts on Mindstones sketchbook. My experiences with this notebook is based on months of use and trying out different things in order to really get a feel for it. 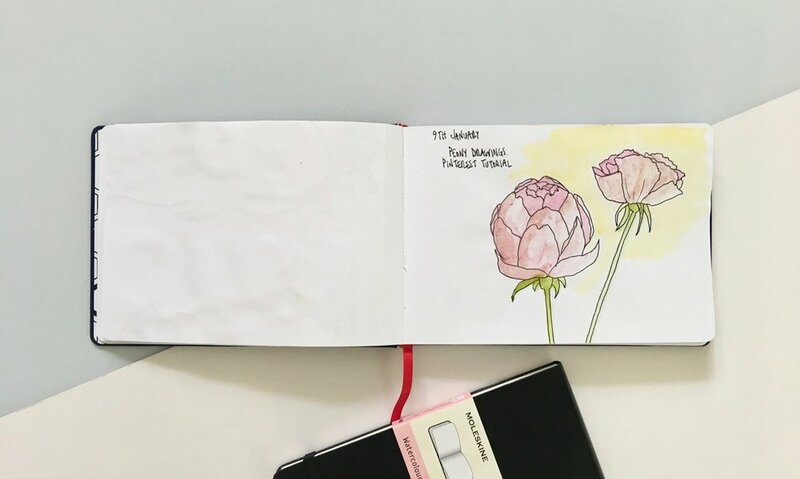 It sounds negative but when reviewing a sketchbook it carries a certain level of expectation. I am not sure the Mindstone sketchbook is comparable to other sketchbooks such as Moleskine and Stillman and Birn for numerous different reasons. The paper is a lot thinner, it’s not art or watercolour quality but simply plain paper. But despite all of this I really have enjoyed using this sketchbook. The linen cover is really nice but I have a soft spot for linen cover notebooks. I’m not sure this style of cover is completely practical for a sketchbook but I like it. My sketchbook has worn nicely and given the sketchbook some lovely character with use. The red accents are a nice contrast to the navy cover. The inclusion of a back pocket for any pieces of paper is a nice feature to have. The size of the notebook works really well and I love the landscape format in a sketchbook. If the paper quality was upgraded in the Mindstone sketchbook this would be an excellent sketchbook. I would like to thank Mindstone for sending me this notebook to review on the blog.